Keratoconus (pronounced KEHR-uh-toh-KOH-nus) is an uncommon condition in which the normally round, dome-like cornea (the clear front window of the eye) becomes thin and develops a cone-like bulge.? Keratoconus literally means ?cone-shaped cornea.? The rate of progression varies. Keratoconus will often progress slowly for 10 to 20 years and then suddenly stop. inability to wear contact lenses. Occasionally, keratoconus can advance rapidly, causing the cornea to become scarred. Scar tissue on the cornea causes the cornea to lose its smoothness and clarity. As a result, even more distortion and blurring of vision can occur. Treatment often depends on the severity of the condition. During early stages, vision can be corrected with eyeglasses. As the condition progresses, rigid contacts may need to be worn so that light entering the eye is refracted evenly and vision is not distorted. You should also refrain from rubbing your eyes, as this can aggravate the thin corneal tissue and make symptoms worse. 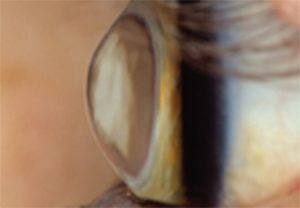 When good vision is no longer possible with contact lenses, a corneal transplant may be recommended. This surgery is only necessary in about 10 percent to 20 percent of patients with keratoconus. In a corneal transplant, your ophthalmologist (Eye M.D.) removes the diseased cornea from your eye and replaces it with a healthy donor cornea. While a corneal transplant will relieve the symptoms of keratoconus, it may not provide you with flawless vision; however, of all conditions requiring corneal transplants, keratoconus has the best prognosis for clear vision.